Photonic lets you display recent and specific photos of users from Instagram, in addition to supporting display of photos with specific hashtags or shot in specific locations. 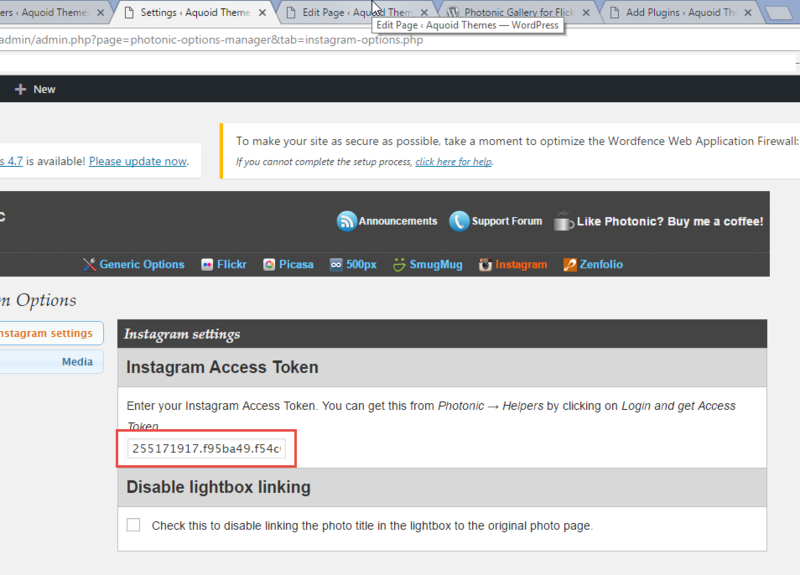 The switch to show Instagram photos is the type='instagram' parameter. Photonic only displays photos from users whose profiles are not private. With effect from version 2.00 the user_id for Instagram is not required. As it happens, as per the note below only the currently authenticated user’s photos are visible. As a result, not passing the user_id will simply cause the authenticated user’s photos to show up. 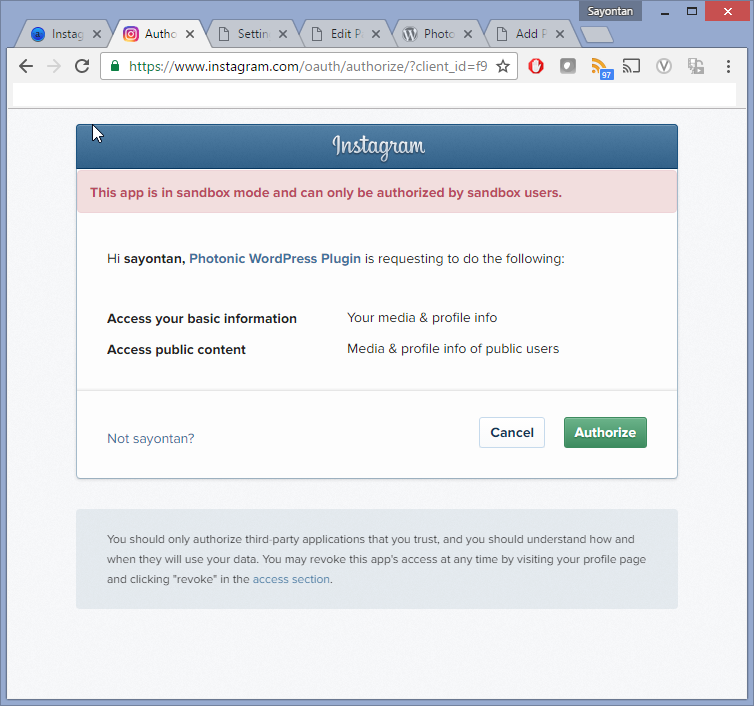 Photonic has been built to support all of the following scenarios, however the culprit here is the approvals team at Instagram, who have been refusing to allow the plugin access to others’ public content. Apparently, according to them, the end users of the plugin are not brands or advertisers or broadcasters or publishers – not sure where they get the idea! As a result of this, in the following examples you will see a message saying “This client has not been approved to access this resource.” Even if the following do not work for you, you will still be able to display photos from your own feeds using Photonic, while I continue the battle to get Instagram’s approval. Let’s say you run a small business with a WordPress-based website. Your company has multiple people who post WordPress content with different logins, and each has an Instagram account from which they pull photos to display in their posts. They can do this by tweaking the user_id parameter in the above shortcode. This client has not been approved to access this resource. I have demonstrated photos with the tag “Fauna” in the above, but you could use pretty much any tag that you are trying to track in tag_name='MyAwesomeCampaign'. Consider the case where you run a resort. People visiting the resort often post pictures, and they specify the location of your resort when they do so. You can use Photonic to pull such photos by location. What if you had some videos in the mix? Photonic can handle that too. I have the philosophy that Photonic is meant for photos, not videos, because Photonic’s primary goal is to assist in making photos easily and beautifully presented for photographers using WordPress. In fact most online photo services deprioritize videos with the same philosophy, and some services don’t even have videos! At the time of writing 500px.com doesn’t have videos, and guess what? Native WordPress galleries don’t support videos! That being said, people often use photo services, notably Instagram to share personal videos, and so, with effect from version 1.66 of Photonic, videos are supported. Note that lightboxes have notoriously flaky support for externally hosted videos. Please refer to the lightboxes page to see which ones can be used. Videos can be incorporated into any layout. Photonic works differently for Instagram than it does for other providers. For all other providers, Photonic lets visitors of your blog perform authentication and see content you have authorized them to see. But for Instagram, Photonic lets you perform authentication, and your users see the same public photos that you are authorized to see. Due to this, you don’t have to store any client ID or secret. Go to the page Photonic → Authentication (Photonic → Helpers in versions of Photonic older than 1.65) in your admin dashboard. That’s it! You are good to go. Photonic is a WordPress plugin providing registered users of Instagram an ability to display Instagram photos on their WordPress websites. The access token retrieved by Photonic only has permissions to read basic profile information and view content shared publicly. It does not follow, post, like or comment on any content on your behalf. This access token is unique to you, and is not saved anywhere apart from your own WordPress installation. Photonic neither collects internally, nor phones back, nor shares your information with any third-party. Ever.